Phnom Penh, Cambodia&apos;s busy capital, sits at the junction of the Mekong and Tonle Sap rivers. It was a hub for both the Khmer Empire and French colonialists. On its walkable riverfront, lined with parks, restaurants and bars, are the ornate Royal Palace, Silver Pagoda and the National Museum, displaying artifacts from around the country. At the city&apos;s heart is the massive, art deco Central Market- this is the Asia many daydream about from afar. Despite being a bit rough on the edges, Phnom Penh retains its former charm as a leafy South East Asian capital with a nice riverside promenade and numerous beautiful Cambodian Buddhist wats, palaces, and other artifacts. 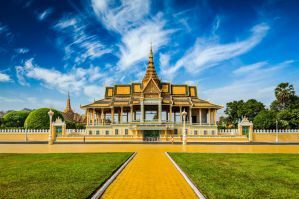 A large infrastructure catering to tourists makes it easily accessible, and many consider it to be one of the friendliest capitals in Asia, as Cambodians have not yet become jaded by mass tourism. Cambodian culture, including its art and music is quite remarkable and modern day Cambodia is a friendly and youthful place. Phnom Penh is slowly gaining high rise buildings, traffic lights, and Western style shopping malls, but overall remains one of the most undeveloped capitals in Asia. The Khmer temples and monuments found here are some of the most stunning examples of Buddhist architecture and art, and Phnom Penh has no shortage of these. The city has obtained a status as one of the hip capitals of the region, with an alluring cafe culture, bustling bars and a world-class food scene and these hostels with swimming pools or hot tubs provide an excellent base for exploring the area. How much do hostels in Phnom Penh cost? Mad Monkey Phnom Penh is located in the heart of the city and is a sociable place where making friends and memories is the goal. They offer a full range of local tours to help you experience the culture of the area and can also help you with travel, tickets, and visas. If you want to relax, the facility also has a swimming pool and poolside bar. If you came to party, the Rooftop Bar never disappoints. The facility offers a variety of rooms to choose from: the dorms have oversized single mattresses, A/C, and individual bag lockers, and the ensuite privates are clean and comfortable with all of the necessary amenities. The on site restaurant serves delicious Asian and Western meals, prepared to international standards. Wi-Fi, linens, and towels are included free with your stay. Lovely Jubbly Villa, a boutique hostel designed with the backpacker in mind, is conveniently located in the city center and offers a large swimming pool for guest&apos;s to enjoy. They cater to backpackers of all ages and budgets and offer 4-bed to 20-bed dorms and private rooms. With free high speed Wi-Fi and outlets next to every bunk, even the most tech savvy flashpacker or digital nomad will feel right at home. You can play basketball/volleyball in the pool or relax and chat over a few drinks on the sun deck. In the media room, you can watch the latest DVD releases on a large flatscreen TV, listen to music, or sing your heart out on Karaoke nights. The facility also offers free Tuk Tuk rides from the bus and boat station??? and can arrange transportation from the airport. It&apos;s a short walk from the hostel to the riverfront, Royal Palace, Central Market, Independence Monument, and Chinatown. The property is less than two blocks from Eclipse Skybar, which has the best view of the city and 6 blocks from the popular nightlife on Street #51. Wi-Fi is available in all common areas. There is a sun deck with comfortable loungers, a pool with pool toys and basketball and volleyball equipment available. An on site bar and restaurant is also available with a large variety of local and international spirits, cocktails, beer, beer towers, jugs and Western and Asian Dishes. Also available is a 41′ flat screen TV with cable, movies, and sports. Parking, linens, and towels are all free with your stay. The Billabong Hostel is centrally located, offers free Wi-Fi, and has a large saltwater swimming pool and garden. Fully air-conditioned rooms are available with inner spring mattresses and quality linens. The property is located only minutes from Central Market, Sorya Department Stores and is only 1km from the Riverfront. The property also features a restaurant and bar with cozy hangout areas around the pool. All rooms have comfy beds, private showers, toilet facilities, air conditioning, and lockers for your belongings. You’ll get a set of bed linen, towel, Wi-Fi as well as maps with all essential information about the going-ons in town. Eighty8 Backpackers hostel is an oasis within the heart of a bustling Phnom Penh with a swimming pool for that much needed cooling dip. They offer a low cost all you can eat breakfast buffet, to help get you off to a good start and are located away from the noisier parts of the city where you can experience real Cambodian city life and Khmer culture, with local shops and street markets nearby, along with many Khmer style restaurants and coffee shops in neighboring streets. The hostel is a short 3-minute walk from Wat Phnom, the traditional center of the city, and close to the Central, Old, and Night Markets which is the starting point of Phnom Penh&apos;s famous Riverside and Royal Palace area, making this a great place to escape the bustle of the city while remaining close to attractions and nightlife. All Eighty8 rooms come with AC, fan, and hot showers as standard and there is free high speed Wi-Fi throughout the hostel. The facility offers both twin and double bed private rooms, all of which have en-suite bathrooms, with some rooms having balconies, room safes, wardrobes and daily water along with tea and coffee making facilities. Dormitory rooms come with big personal lockers and en-suite shared bathroom facilities and each bed has a USB charger socket and reading light. The hostel now also offers sleeping pods, a dormitory style room with private sleeping pods and lockers with shared private en-suite bathroom cubicles. All pods come with reading light, USB charger sockets, fans and room AC. Eighty8 has a large common area with a big screen for sports and events along with a restaurant and bar serving both Khmer and western delights along with cold Cambodia beers and refreshing cocktails. The property has a swimming pool set up for pool volleyball and a basketball hoop, a pool table that is free to use, and a free book swap library. Parking, linens, and towels are free with your stay.